At Metropolitan Design/Build we install new roofs and repair roofs. You can trust our roofing professionals to handle all your Rockville roofing needs. Our trained and licensed professionals are the best in the industry and follow all the manufacturer guidelines to ensure that your roof is installed and or repaired according to strict guidelines. We are certified installers. When you have Metropolitan Design/Build install a new roof on your Rockville, MD home you get unmatched customer service and quality from a proven roofing leader in the Maryland, DC, & Virginia area. Will explain the benefits of the different roofing materials and colors and sections that are available for your homes roofing project. New replacement gutters may also be discussed as many times they are replaced at the same time. Schedule an in-home Roof Consultation today by filling out our online form on this page or calling us at (301) 870-2145. With these important roofing procedures, you will have not only have a new roof that will last for years to come, but it will save you on future costly roofing repairs. At Metropolitan Design/Build, we provide options for financing for your roof project. We understand that many times you may not be prepared to for a roof replacement so we offer flexible options for you. Simple contact us or ask one of our expert roofing professionals and we’ll be glad to explain what options may be best for your situation. If you are a homeowner located in Rockville and you need a replacement roof contact us today! We provide many options and offer a very aggressive pricing structure. We also provide emergency roofing services for homes that may have been damaged due to severe weather. If your home has been damaged due to high winds, or strong weather contact us as we have teams of professional roofing experts ready to handle any roofing emergency. We have working relationships with all the major insurance companies. 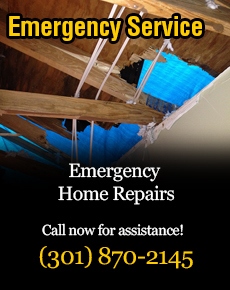 If you need help because your roof was damaged in a storm, contact us at (301) 870-2145.